Gozo is inseparable from the sea that surrounds it. The Mediterranean's crystal blue waters have shaped the island's people, their history and way of life. In the hot summer months, the action is always in and around the sea. There is no more exciting and satisfying way to soak in all of the beauty and charm that is Gozo! There is so much to see and do on our kayak tours! 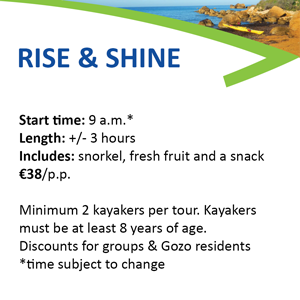 Experienced and beginner kayakers alike can enjoy a paddle along the towering cliffs of the west coast and snap a selfie in front of Fungus Rock, or have a swim in Comino Island’s Blue Lagoon and get inspired by the historic villages that dot the skyline, or catch a glimpse of flying fish and go rock hopping along the north coast, all while exploring caves or bays otherwise inaccessible by land. What are you waiting for? We're offering some pretty incredible tours for 2019. First, there's two half-day tours: a morning tour for you early birds and an afternoon trip for those of you who like to sleep in. We've also got an awesome full-day tour where you get double the fun! Or if you're feeling unique you can create your own custom tour, large or small at a surcharge. 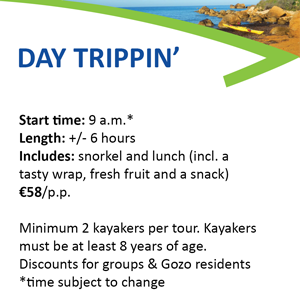 Our tours include either lunch or a snack (depending on the type of tour), all the kayaking equipment you need as well as a snorkeling set, and a fun, well-informed, really cool guide. The tours are popular, so be sure to book early. 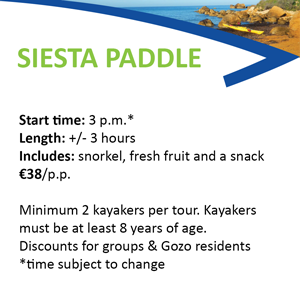 We're also happy to offer discounts for groups and Gozo residents. 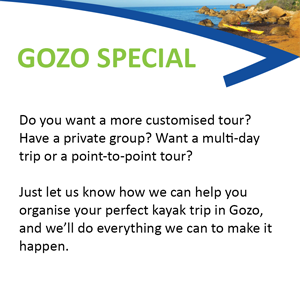 So contact us for more information or follow the links below to start your Mediterranean adventure!